Most teachers draw a lot of satisfaction from the knowledge that they are making a difference in the lives of children. Ironically, however, most teachers rarely actually see how their students live. Especially in high-poverty schools, it can be hard for teachers to understand the home and family conditions that kids return to when school lets out. Misunderstandings can be two-way. Parents might meet a teacher in person at a school event or a parent-teacher conference, but these events are formal and impersonal. Parents and teachers interact in limited ways, without really getting to know each other. It can be hard for parents to believe that teachers understand or care about their kids' life beyond the classroom. The idea is disarmingly simple: Teachers, in pairs, go home with students. They talk for a bit with parents and family. And, well, that's pretty much it. Some school districts address this divide head-on by investing in parent-teacher home visits, which enable teachers to visit students' homes and meet their families. The program, which has been around for decades, is gradually growing as school districts and teachers unions have come to understand and appreciate its value. The concept is disarmingly simple: Teachers, in pairs, arrange a time to visit students at home with their parents or guardians. They talk for a bit, without a fixed agenda. And, well, that's pretty much it. The program has won some influential fans, because despite its simplicity it seems to deliver results. According to Jonathan Raymond, President of the Stuart Foundation [a supporter of Ed100.org], home visits "tear down barriers, grow relationships and serve the whole child in a way that a meeting in a public school setting can’t." Setting up a home visit program is straightforward, especially for schools or districts that follow the playbook developed by PTHVP.org. The program is inexpensive. Districts generally begin by asking a faculty member to lead a pilot project. The faculty member contacts PTHVP.org for help to get started. A training meeting to get everyone on the same page might cost $5,000 - $7,000. Thereafter, PTHVP recommends budgeting about $70 per home visit: teachers are paid for their time and reimbursed for travel costs, if any. A core tenet of the program is that it should be open to all, but also voluntary for all. Implemented in this way, the program has won many supporters and rarely sparks opposition; teachers unions generally support it enthusiastically. The program has proved popular with teachers and families, too. Most important, the program appears to deliver some lasting results. Setting aside hard-to-measure benefits like increased empathy, the program seems potent as a way to improve attendance. Flexibility. You can conduct this program one year without necessarily creating an obligation to do so on an ongoing basis. You can begin with a pilot project. Recognition. Leading the program can be an opportunity to recognize and compensate an outstanding faculty member. Fundraising. Parent organizations and local businesses may find this program attractive to support and celebrate. Build relationships. 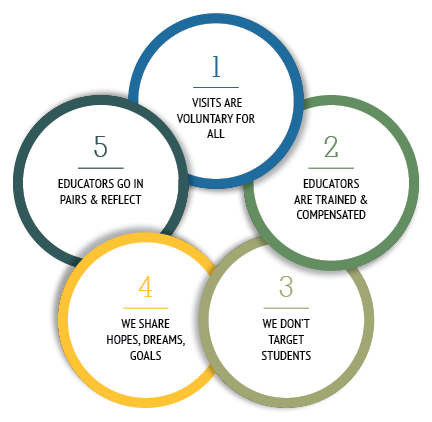 Home visits, conducted in pairs, build informal connections between faculty members. Low or zero net cost. Schools receive funding based on Average Daily Attendance. If the program helps improve student attendance, increased revenue offsets the cost.